Nicole Miller earned an MFA from the University of Southern California (2009) and a BFA from California Institute of the Arts, Valencia (2005). She has had solo exhibitions at Ballroom Marfa; High Line, New York; Kunst Werke, Berlin; Centre d'Art Contemporain, Geneva; the Los Angeles County Museum of Art; and LA><ART, Los Angeles. 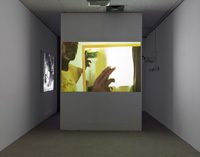 She has been included in numerous group shows, most recently Portraits and Other Likenesses at The Museum of Modern Art, San Francisco; The One and the Many at Project Row Houses, Houston; Artists' Film International at the Whitechapel Gallery, London; fore at the Studio Museum in Harlem, New York; and Made in L.A.: Los Angeles Biennial at the Hammer Museum, Los Angeles. She is the recipient of the Louis Comfort Tiffany Prize and the Rema Hort Mann prize, among others, and fellowships from the California Community Foundation and the Core Program at the Museum of Fine Art, Houston. Miller's work plays on the conventions of documentary film to create video portraits that challenge our ideas about representation and the construction of identity. With a keenly sensitive eye and subtle touch, Miller makes storytelling and performance the subjects of her work as much as the individuals or locations being presented. 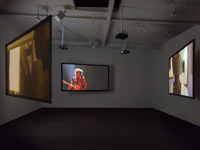 Recent projects include Anthony (2015), a video portrait of a deeply committed Jimi Hendrix impersonator performing Nina Simone's "Ain't Got No/I Got Life"; Death of a School (2014), a meditation on a soon-to-be shuttered school where the artist's mother had taught; and David (2012), in which a man narrates the story of the loss of his arm as he enacts phantom limb therapy in front of a mirror. The 2015 jury included Sarah Lehrer-Graiwer, independent art writer and curator; Kathryn Kanjo, Deputy Director, Art & Programs at the Museum of Contemporary Art, San Diego; Catherine Opie, artist and Professor of Fine Art, University of California, Los Angeles; and Robert A. Pruitt, artist.